This aluminium inlet plenum was made to fit onto the standard injection lower section of the inlet manifold and fit within the Renault 5 Gt Turbo engine bay. This features staggered inlet trumpets, and takoffs for aftermarket ecu sensors. This stainless steel exhaust manifold was made to fit into an Austin Healey Sprite running a Coventry climax engine. Made from 304 stainless and all fully TIG welded, this compliments the attention to detail the owner has put into the rest of the car. 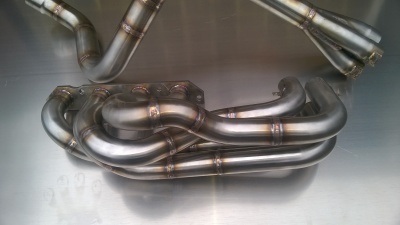 This is one of the many exhausts we have made to the customer specification. All made from 304 stianless, fully TIG welded, and back purged. This one features an external wastegate take off. This was made to fit a bespoke turbo onto a standard 5 port A series engine, and fit within the standard round nose front. This setup allows you to run larger turbos without the need to run a bulkhead box, and also takes advantage of being able to run equal length pirmaries to help improve the performance of the engine. 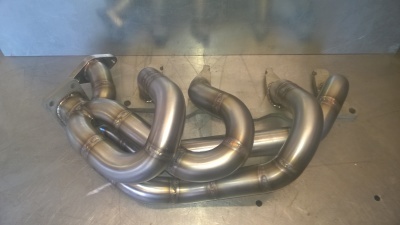 This will soon be available as a standard kit, comprising of the stainless manifold and downpipe to suit the gt series turbos, but on request it can be made to suit most turbos to customer requirements. 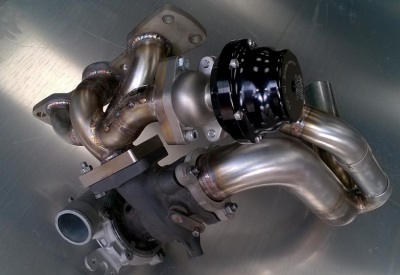 This manifold and downpipe setup has been made to customer specification to enable fitment of a GT1544 turbocharger onto a 998 A series engine in a mini without the need for a bulkhead box. All fully TIG welded, back purged, and made from stainless steel. This exhaust manifold was made to fit a GT1752 into a Daihatsu Charade GTti. This manifold features an external wastegate with the option of an interchangable screamer pipe that vents to atmosphere or returns back into the downpipe. This manifold was made for a full race mini engine featuring the k1100 motorbike head. it features, equal tuned length primaries, 4 into 1 megre collector. Alll made from 304 stainless steel and all welds back purged throughout. 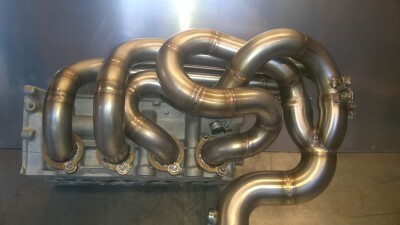 This manifold was made for a full race Hayabusa single seater. This was made as a prototype for a car to be race and developed during the 2016 race season. Made from 304 stainless, equal length primaries, megre collectors. 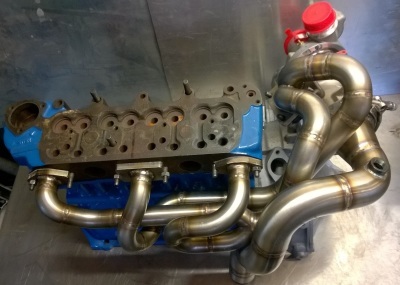 This manifold was made for a full race single seater. Made from 304 stainless, theis features stepped headers, equal length primaries, 4 into 1 mergre collector. 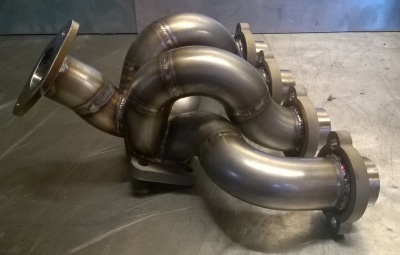 This manifold was made for a someone doing an engine conversion using the 1.7 B18FT engine into a Renault 5 GT turbo. I was given the original manifold to rework and improve on. Made from 304 stainless equal length primaries, this one also features an external wastegate takeoff. Due to a poor flowing exhaust manifold, we were asked to improve on the design and add an external wastegate and screamer pipe. This was made to fit a Tiger Kit car running a Yamaha R1 engine and turbo charger. We jigged from the old manifold to allow the customer to re use their uxisting exhaust. This fuel tank was made to replace the customers rusty old tank. Made for 2mm Aluminium, this fuel tank was made to original size and spec, with internal baflles and original outlets to make it a simple swap for the standard tank. We can make most configurations of fuel tankd up to suit your requirements. This Aluminium oil catch tank was a custom design, made to customers requirements. This Aluminium oil catch tank features internal baffles.